Tucked in at night, a child sleeps warm and safe beneath the covers. Thoughts of morning’s light and the hopes of good things to come merrily chase each other in his dreams. In anticipation, a child waits for Christmas. 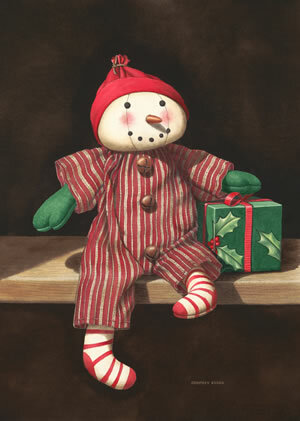 The painting, designed for use as a Christmas Card for the American Children’s Home, has become one of Dempsey’s beloved Christmas images to date. 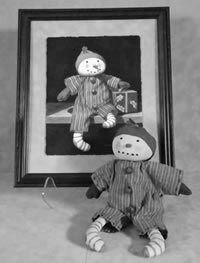 The small doll accompanies the framed print and both promise to be a source of warmth and smiles throughout the year. You may look for the hidden hummingbird image along the corner of the gift.